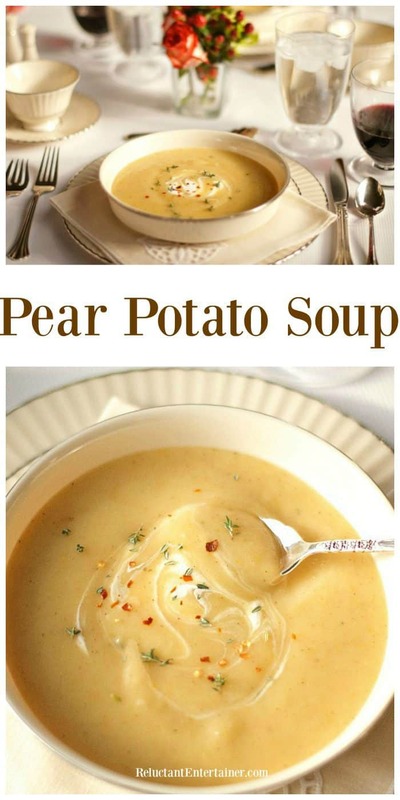 This Easy Pear Potato Soup is a delightful soup to serve at a Downton Abbey dinner party! 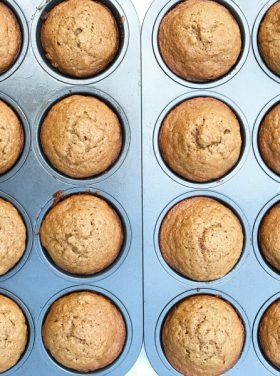 Even better made with Five Spice flavor and creme fraiche. Enjoy this surprise visit to Downton Abbey in England! Friends, I am in London this week! It’s been quite the journey, but fun so far. I’ve been invited to visit London with Grey Poupon, who’s sponsoring my trip, in celebration of Downton Abbey’s 6th and final season. 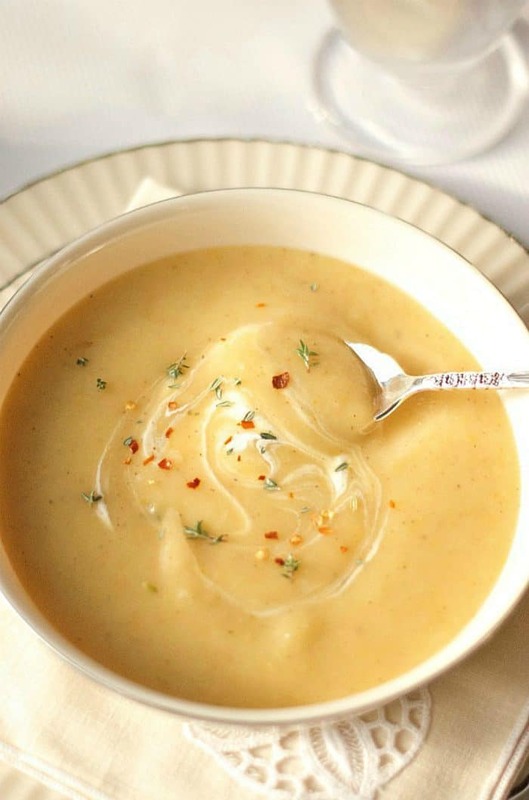 Follow along as I share this delightful, simple Pear Potato Soup Recipe. 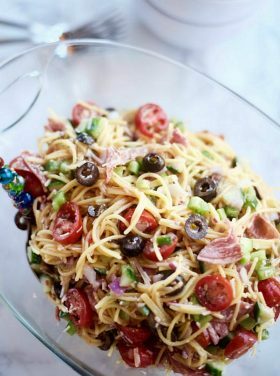 It’s so good, easy for a Downton Abbey dinner party, or just lunch or dinner. The leaves have changed here already, it’s rainy and cool (I bought a new raincoat), the streets are hustling and bustling with people, and my friend Lori (RecipeGirl) and I are soaking it all in. It’s been 8 years since I’ve been to London. You can also check out RecipeGirl’s recipe today: English Sausage Pastries. YUM. Later this week we are scheduled to visit The Downton Abbey Kitchen, presented by Grey Poupon, to take part in amazing stops to locations featured in the film. 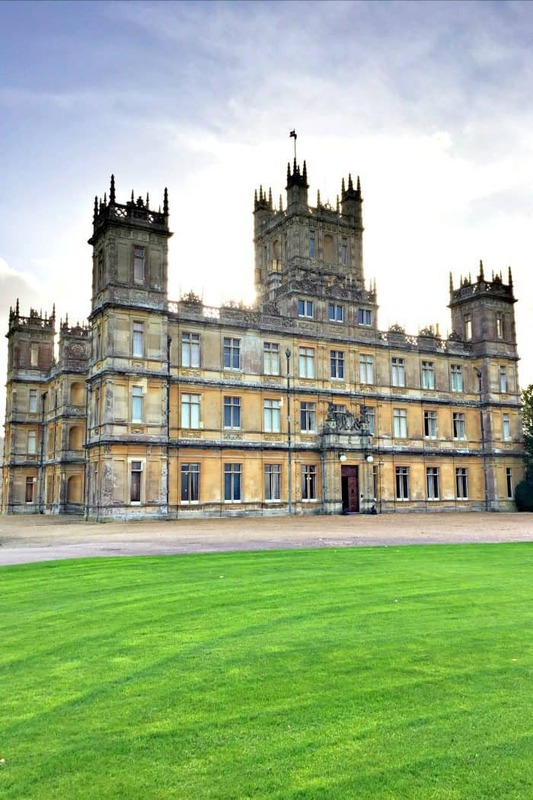 That’s right, we get to experience Downton Abbey (Highclere Castle) in person this week! I’m so excited. Most of you know that this this is the last season of this wonderful show, premiering January 3rd in the US. It will be hard to say goodbye to some of my favorite characters. And by the way, the UK launch was in September, so I’m pretty sure none of the cast will be there when we are. But, still, we’re staying at The Ritz London Hotel! Remember Alfred Nugent, who flirted with Daisy? He was O’Brien’s nephew, who arrived at Downton Abbey in 1920 after Alfred’s mother wrote to her sister, asking her to help find Alfred a position there. He worked as a footman, but eventually left Downton to get a job at the Ritz. How fun would it be to pass Alfred in the hallway at the Ritz … I’ll let you know … (hee-hee). We head there on Wednesday! 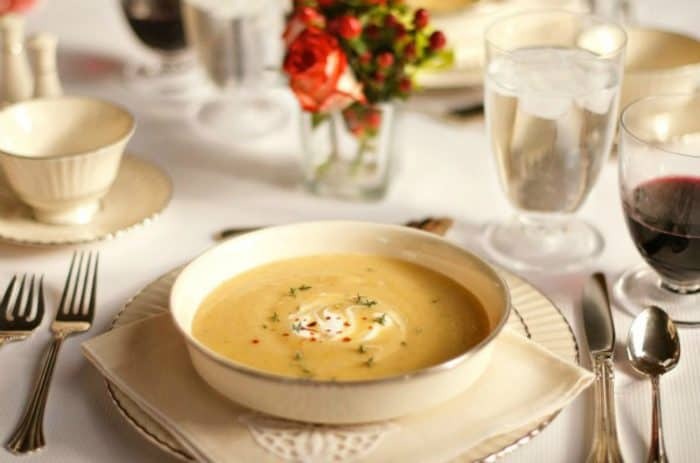 Since we’re hosted by Grey Poupon, I’m starting off the holiday season with a delicious recipe inspired by Downton Abbey that I created last week in my own kitchen, that I think you will love. 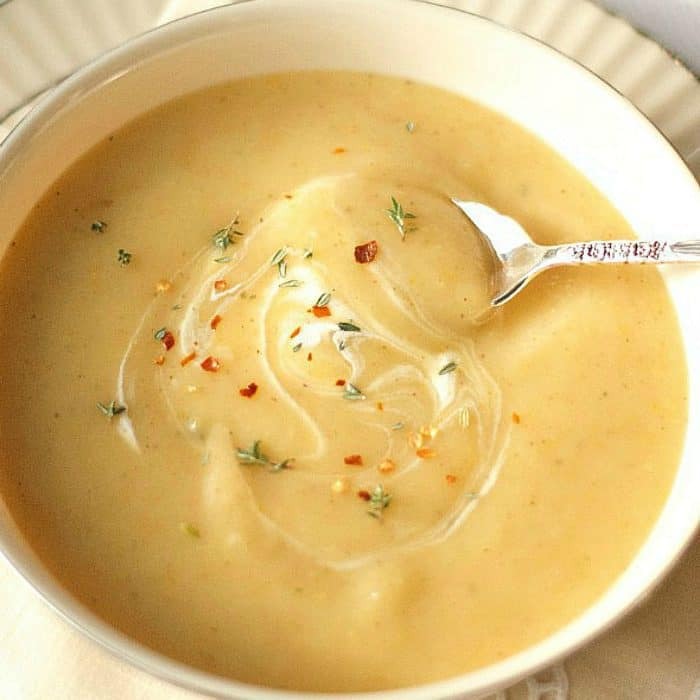 This Easy Pear Potato Soup Recipe is very simple, made with pears and potatoes, yet it has so much flavor, with the sweetness of the pears, and the irresistibly savory flavor of Grey Poupon mustard, topped off with fresh, sweet thyme and a splash of creme fraiche. Host a Downton Abbey party. Pull out the China, and serve to your guests for the holidays! In true family style, my sister came over last week and cooked in our kitchen, making this delicious soup. 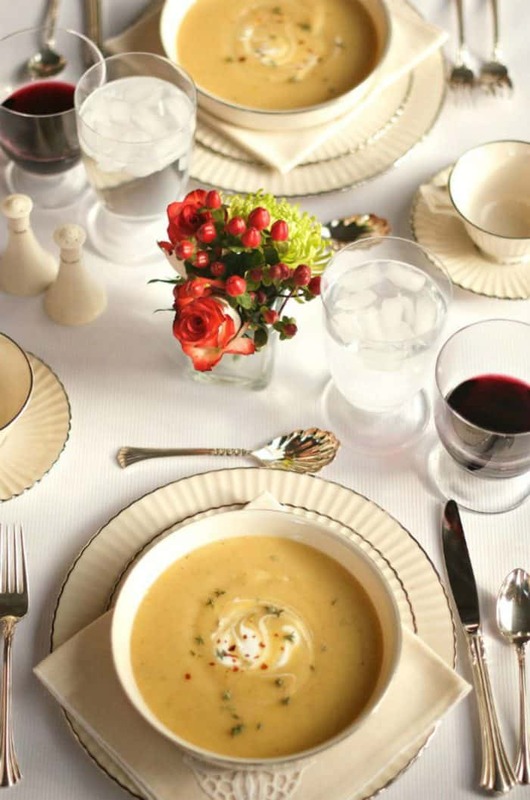 Great food has a history and connects us with our past, so we talked a lot about our Grandma Friesen, how she always made potato soup. In fact, my dad and his wife Ginny then came over and enjoyed lunch with us! Oh, and we’re also visiting the Victoria & Albert Museum, and heading to Bampton to tour the Downton Village, and then to Highclere Castle (be still my heart), for a tour and high tea. 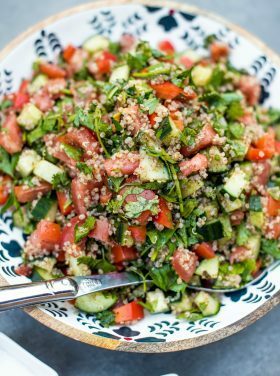 So friends, if you’re excited like I am, getting ready for Season 6 (and the finale), here are more amazing Downton recipes for you to enjoy. 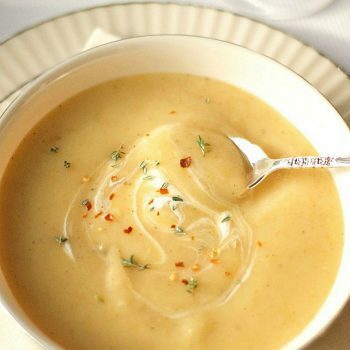 A delicious Vegetarian pear potato soup, even better served with Five Spice Powder and creme fraiche on top! In a large pot over medium heat, melt the butter; stir in the onion. Turn the heat down to medium-low, covering the onions. Stir occasionally for about 10 minutes, or until the onions are softened. Add in the maple syrup, pear, salt, thyme, and nutmeg, stirring gently. Allow to cook on low heat, stirring frequently, for about 5 minutes. Add in the broth and mustard, bring to a boil, then turn the heat down to low. Cover the pot and let the soup simmer for about 15 minutes or until the potatoes are soft. Transfer the soup in batches to a blender (or food processor), and puree for 2-3 minutes until smooth. Salt and pepper to taste. Serve with a spoonful of creme fraiche, a sprinkle of fresh thyme and red pepper flakes. More about my trip: Downton Abbey Egg Salad Tea Sandwiches and Downton Abbey Lavender Tea Bread. 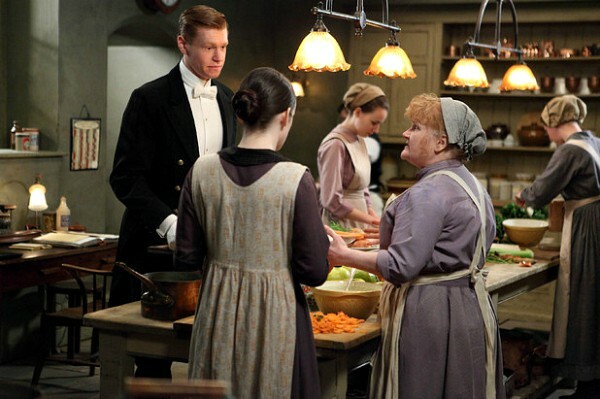 Follow the Downton Abbey Kitchen. 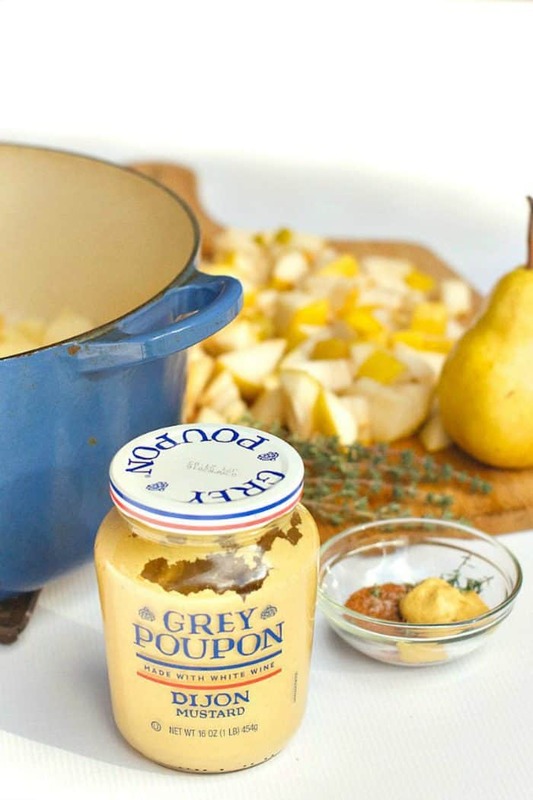 Follow Grey Poupon on Facebook and on Pinterest. Follow RecipeGirl and check out her amazing English Sausage Pastries recipe today! This post is sponsored by The Downton Abbey Kitchen and Grey Poupon, who also arranged for my travel. We use Grey Poupon in our kitchen; as always, all opinions are my own. Do you just sprinkle the Five Spice Powder on top of the Creme Fraiche and how much? I can’t see where it is mentioned except in the heading. Thank you. 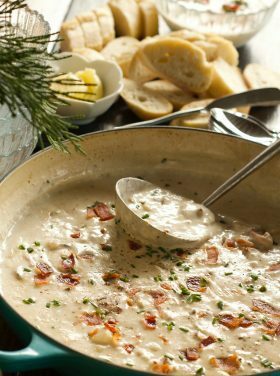 i want to make this soup i was wondering if i could make it a day ahead heat and add the last two ingredients and serve if it is just as good the next day as it is the day it’s made? This is so completely delightful!! And I’m still fan girl freaking out over your Downton Excursions!! 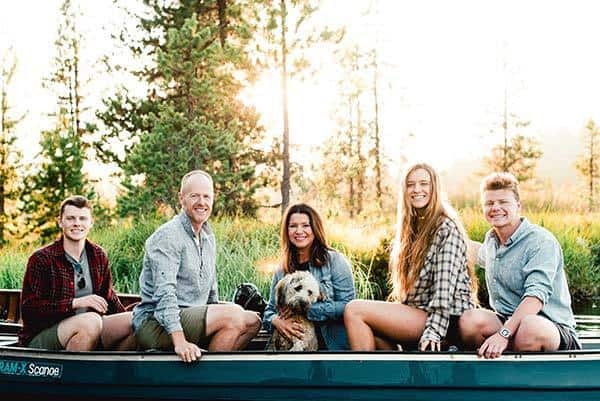 Squad Goals for sure! This soup is so pretty! I’m loving the combination of flavors. And your trip, so awesome! Just about to start making this! Just curious….do I have to peel the pears? No, you do not have to peel the pears. But either way works! ENJOY! I love London, and it looks like you had a wonderful time! And this soup – I love it! 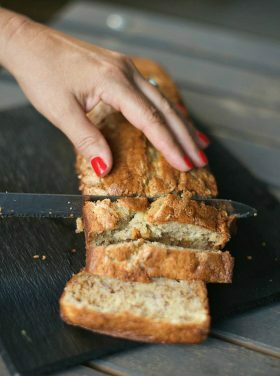 I must make this recipe! Wow! So jealous. I would love to see Highclere Castle! Have a great visit. I’m a party planner and was floating the idea of having: Downton Abbey for a Day Workshop & Dinner Party. Going to research some of the many mansions here in the Minneapolis area. That kitchen menu might come in handy. Thanks for that. Any Minnesota readers like the idea? Mssg me on FB. I am living vicariously through all of your snaps!!! I love Downton Abbey – what a dream trip for you and Lori!! Have so much fun you two! I’m so jealous I can barely contain myself!! OMG. I LOVE London! I spent a week there while on my honeymoon and it is one of my very favorite cities! 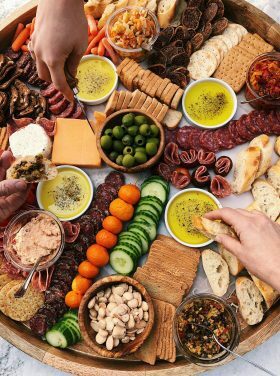 And Grey Poupon sounds like the perfect hosts! Plus Downton Abbey?? AH! I am seriously addicted to the show and devastated that it’s ending. This soup! It looks amazing! Perfect for chilly fall weather no matter what continent you are on. Have fun! Well, you know how jealous we all are!!! Spectacular! And the soup looks pretty spectacular too. We always have huge jars of Grey Poupon in our house from Costco. We go through it at an alarming rate! Got mine at Costco, too. Stocking up for the holidays! Would be fun to have you here with us Carolyn! 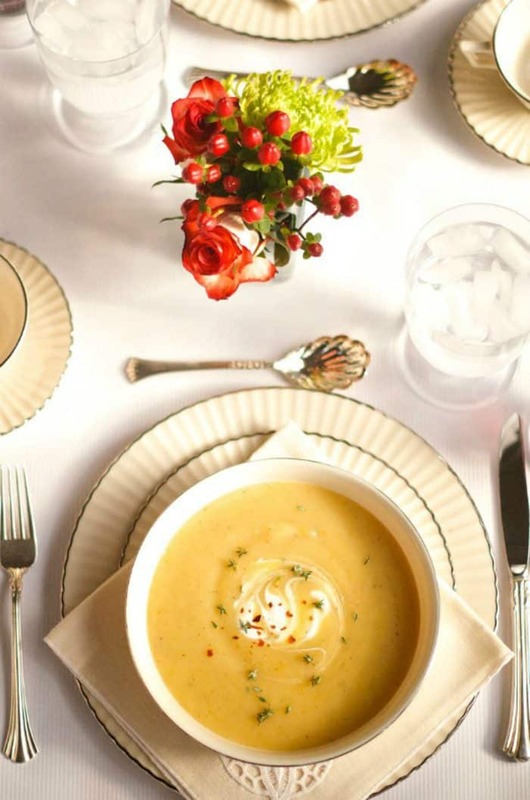 Soup never looked more elegant. Have a great time in London. What a great opportunity. Jealous! HOw fun!! I will admit, I’ve never watched the show! Don’t judge…lol! Soup sounds wonderful!!! This is such a beautiful soup!!! Downton Abbey obsessed here… so can’t wait to hear about your experience! What a special experience Sandy! I’ve loved Downton Abbey from the beginning and hate to see it end. I know they director will be doing a show in the US next so that will be fun. Enjoy your trip and can’t wait to read more about it! What a trip, Sandy! That sounds amazing. I have such fond memories of England… the food, the people, the scenery. The pear and potato. I never would’ve thought of that… but it looks absolutely marvelous! 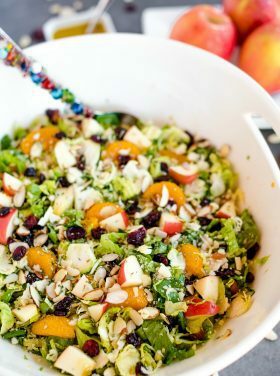 This looks so creamy and delicious and what a great idea adding the pear in. I cannot wait for Downton Abbey to start. My “Downton Abbey” tea set is all ready to go! We’re all set, too! Can’t wait! !